Tapping out a beat may help children learn difficult fraction concepts, according to new findings due to be published in the journal Educational Studies in Mathematics. An innovative curriculum uses rhythm to teach fractions at a California school where students in a music-based program scored significantly higher on math tests than their peers who received regular instruction. 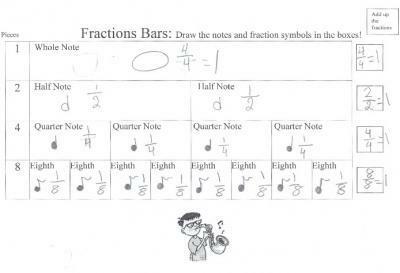 This is a worksheet from an innovative curriculum that uses musical notes and rhythm exercises to teach fractions to third-grade students. The program was devised by San Francisco State University Professor Sue Courey and is the subject of a new study published in Educational Studies in Mathematics. Courey devised Academic Music with music teacher Endre Balogh. They borrowed aspects from the Kodaly method, a Hungarian approach to music education that incudes movement, songs and nicknames for musical notes, such as "ta-ah" for a half note. "We're suggesting that teachers put music in their arsenal of tools for teaching math." Courey said. "It's fun, it doesn't cost a lot, and it keeps music in the classroom."